I was cleaning out my computer, getting rid of any pics I no longer need when I came across this beauty!!! Okay, so this photo is from my 9th grade graduation. In this photo are some people who I still consider some of the best friends I have ever had- whether I've seen them recently or not. There are some people who you will always love, always feel lucky to know- and this photo reminds me of some of those people. Anyway, so I was cleaning out the photos on my computer and I came across this, so I thought it would be fun to blog about it and tell some of the story to go along with it. In fact, I think I will periodically post on old pic from my childhood and do just that. So we'll start with this one. Forgive me for making fun of myself, please. I know you are all LOVING the dress. Oh, in case you didnt know, I am the one in the front row, middle right. I know, what's up with the brown hair? I'll get to that. So this was such a big day :) LOL. My mom took me to get my hair done. My boyfriend at the time, Doug (yes, you all remember that one, dont you- we totally "went" together- for like a week- which just so happened to be THIS week) was going to meet me and my friends at the dance (since I wasn't 16 it was he and his friends, who I also "went" with for like a week- just a different week), so I was all excited to get dressed up with my new dress that I drove 3 hours to find (no, I couldnt drive- my MOM drove me 3 hours). Im drifting here....so anyway, my mom said I could get my hair done at the- warning here- beauty school (this is your first hint of trouble in case you didnt pick that up). I had been there before and gotten what they called "clear" something or other that was just meant to make your hair shinier. So when we got there, we told them I wanted the same thing I always got. The girl who usually did my hair was on maternity leave. So her substitute pulled "my" card and got to work. To shorten this up a bit, a supervisor was called over somewhere during the process, at which time she asked me what color my hair was when I came in (to which I responded "blonde") and was told it was now brown with green streaks. The dear lady had pulled the wrong card and colored my hair a nice color called "Moroccan Sand". I stayed for several hours while they bleached the heck out of my hair and by the time I left, it was a reddish brown, but at least the green was gone. Oh well, I still had that FABULOUS dress :) So we had graduation. I met up with my BF at the dance and his first question was "wasn't your hair blonde when I saw you earlier today?" Ummm, yeah it was. But anyone who knows my luck could have seen that one coming a mile away. So then I got this pic, which makes me smile all these years later. I love it! lol I totally picked you out immediately - you look so cute! Laughing at the dress of course, but that was totally in style at the time. LOL That's awesome. Lawrence and I stared for a while until we could pick you out. The poofy hair and poofy dresses made seeing your faces difficult. ;) ha ha ha Just kidding, I've got the same fun look myself...but I didn't pull it off half as well. This is so cool! Of course I went to the better school SRJH but hey that was like how many years ago! Everyone looks so young. We were so cool back then. 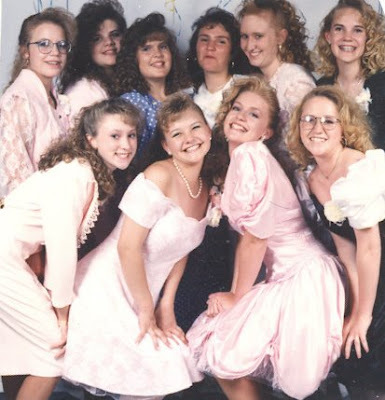 Our dresses still rock and our hair is still cool. Gotta love the 90's! That was GREAT!!! I clicked on your blog and just started laughing. We did have some good times and I too still consider you a great friend.